Can you say finocchio? After reading The Reluctant Tuscan by Doran, former writer of The Wonder Years and other well-known American sitcoms, not only can I say finocchio, I now understand a number of other words and expressions in Italian. Becoming tired of my reading tour de France, I decided to take a little trip to Italy and the Tuscan countryside where Doran and his wife Nancy restored a 1,000 year old rustico. This book was so funny! I can understand why the author was so successful in Hollywood. Immediately after turning the last page, I beat a path to my kitchen to see what I could cook up! The food described in the book made me even hungrier than my previous forays with French cooking. This probably has much to do with my Italian heritage. As I read the hilarious story of their frustrating restoration project, I felt like I was seated at the table with the author in the local osterias. I could smell the olives, taste the wine, and my mouth watered at the prospect of homemade pasta with pesto. There were many things I enjoyed about this book. 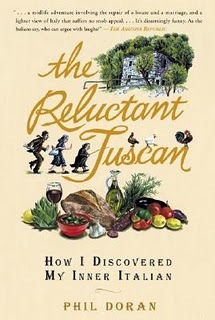 I think I was most moved by the way in which the author comes to the realization that life in Italy is idyllic. He learns to put the stress of life in L.A. behind him and begins to appreciate every day, taking time to smell the roses. Doran, a man who “loathes gardening”, offers the following Italian expression which I loved: “If a man has a woman he’s happy for a day, if he has a cow he’s happy for a week, but if he has a garden he’s happy for a lifetime”. I love gardening; need to have my hands in the dirt every so often, feeling it renews my soul. I think this came from my grandfathers who were born in Italy. Both were farmers in the old country. I must have some of that love of the earth in my blood. One of the few memories I have of my grandfather was the time when he took me and my father for a walk in his garden. Still a small child, I remember my grandfather pointing to the tall plants looming high over my head with his one good arm. Tragically, he’d lost the other arm in an accident at the factory where he worked making spaghetti. He was so proud of the vegetables he’d nurtured on the extra lot my immigrant grandparents owned next to their bungalow in the city. Funny, I do the same thing so many years later. When friends and relatives come to visit, I am compelled to show them my garden. For me, it is like showing off my children. Look what I raised! I do believe life is so much better when taken at a slower pace. Perhaps it is my age that helps me appreciate the simple things in life. I do know that much can be missed when one moves too fast looking too far ahead. I don’t need to move to Italy to appreciate this philosophy, but reading this book sure made me wish I could in order to immerse myself in the culture of my ancestors. This entry was posted in Uncategorized and tagged Doran, Italy, Tuscany, Wonder Years. Bookmark the permalink.